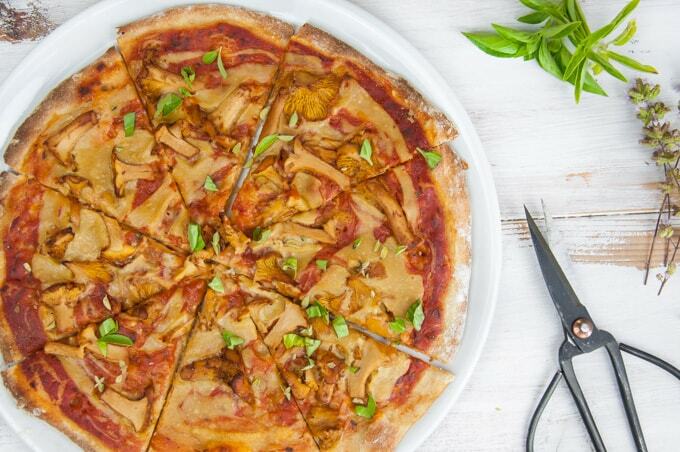 Are you looking for a vegan pizza recipe? 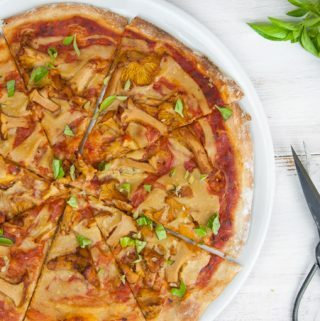 Try this super creamy vegan Chanterelle Pizza with homemade vegan cheese sauce and homemade crust! I love chanterelles! And I love pizza! 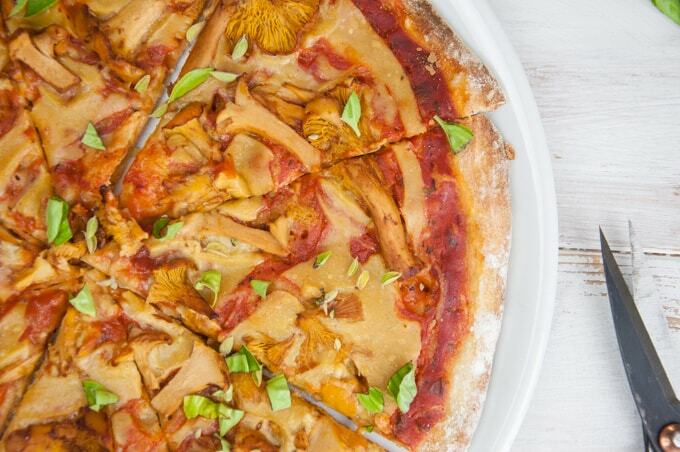 So what could possibly go wrong with a chanterelle pizza? I loved how creamy this pizza turned out. Chanterelles are my favorite fungi ever, although I eat common mushrooms much more often because they are available all year around and easily accessible, I always look forward to chanterelle season. For the cheese I used the Nooch Cheese Sauce from the blog – the amount of the cheese sauce is exactly right for two pizzas! If you only make one pizza you should half the recipe for the cheese sauce or use the rest for something else – a dip for tortilla chips for example! For the crust, I made a regular pizza crust from scratch, but if you’re pressured for time, have a look at my yeast-free pizza dough (because no yeast = no rise = no wait) or you could use a store-bought pizza crust (but that’s not as cool as making your own). 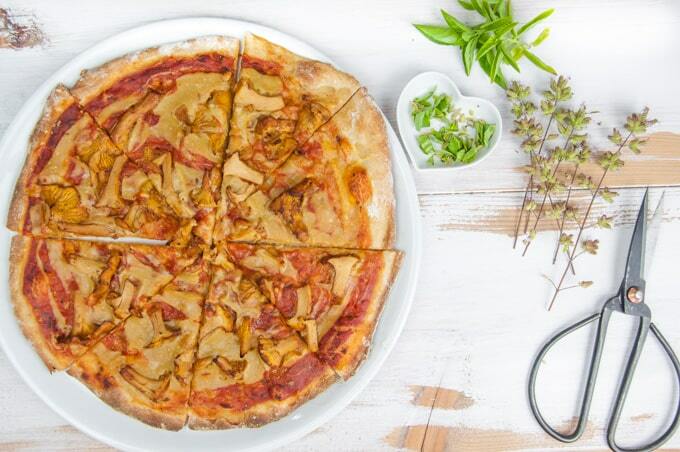 Are you looking for a vegan pizza recipe? 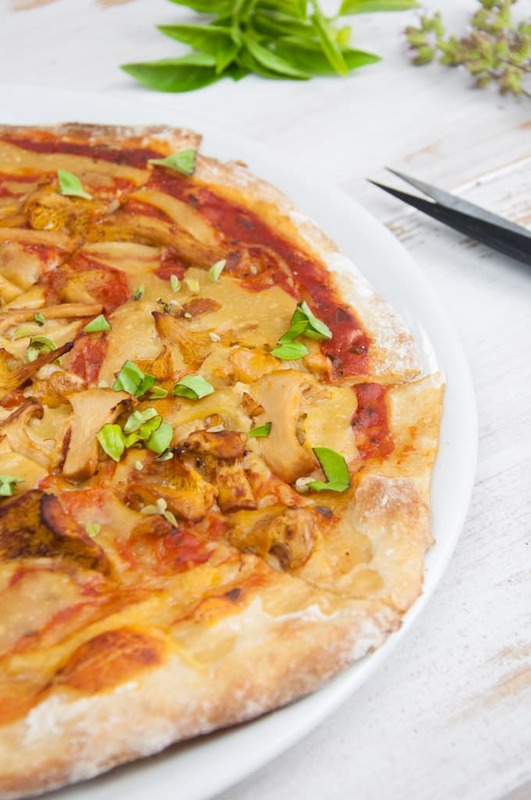 Try this super creamy vegan Chanterelle Pizza with homemade vegan cheese sauce and crust made from scratch! 2 1/2 cups 00-flour - perfect for pizza! For the pizza dough, put all the ingredients in a kitchen machine or mix by hand and let it rise covered in a warm spot until it doubles in size (about 2 hours). 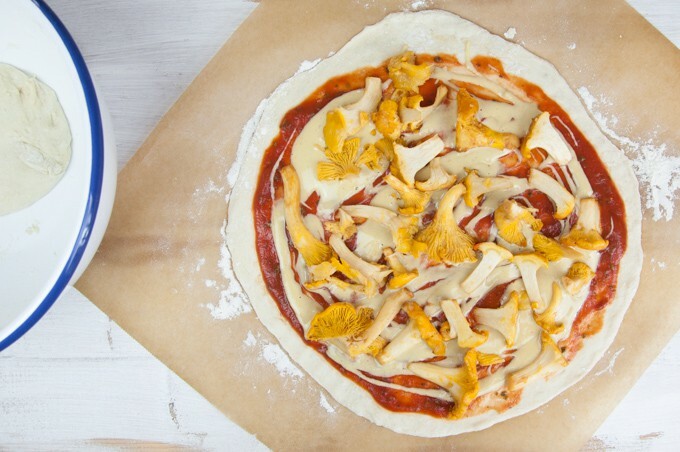 Divide the pizza dough into two equal pieces, and roll out each of it on a floured parchment paper until it's a nice pizza base. At this step I already like to transfer the parchment paper with the pizza dough onto a baking sheet. Mix the tomato purée with the salt and garlic powder. Add it to the dough and spread it with a large spoon. Prepare the Nooch Cheese Sauce and add it onto the pizza. Wash and clean the chanterelles. Cut large ones in half and add it onto the pizza. Put the pizza in the oven and bake for about 10-15 minutes. After baking, top the pizza with the fresh basil and oregano. Enjoy! *If you don't have a lot of time to let the pizza dough rise, you could also use my yeast-free (no yeast = no rise = no wait) pizza dough instead or use a store-bought pizza crust. **I used store-bought tomato purée (with salt, no additional herbs) for this recipe - it's often canned or in tetra paks, not to confuse with tomato paste which is thicker in consistency. Thanks for sharing the recipe – It does look delicious, and not too complicated…sometimes I like my pizza nice and simple, rather than loaded with a variety of toppings. Thank you so much for your lovely comment, Liz! Same here, sometimes I do like to stuff all different kind of toppings mostly into calzones (yumm!) lately and sometimes nice, clean and simple. However I’m so looking forward to the chanterelle-saison this year. I’ve never had a chanterelle but oh my goodness I need to! And it NEEDS to be on pizza drowned in the most luscious river of nooch-y cheese sauce. This actually sounds like the most perfect vegan pizza–simple, homemade all the way, and just the good stuff! !